Every boxer has a cornerman. A cornerman is part pyschologist, part motivator, part parent, part medic. I think we ALL need a good cornerman. And we all should be one to one another. Here is an example from last Friday. I challenged Casey “Wubby” Simon, a flooring sales person, on Friday at 3pm to do 5 cold calls. Or warm calls. I said the day before a holiday is my favorite time to call. Why? If the person answers, they know they are not the only ones that are working pre-holiday weekend. It usually goes a long way to them thinking, “wow, I’m impressed. Most of the guys that do business with me aren’t even ANSWERING THEIR PHONE, and this person has time TO ASK FOR MY BUSINESS!” Good stuff. Ben “Varsity” Lee is overhearing the conversation. He works in millwork (not the same department, which I guess might even be a cooler fact of the story) and he gets right in Casey’s face and says “I’ll be your hype man, LET’S DO THIS!” Reminded me of a small dog that is ready to play “fetch!” Remember installing, pulling a load, paying the bills, or SELLING, is just a game, if you make it that way! I could tell right away that this gave Wubby: 1. CONFIDENCE 2. ENERGY. Both keys to doing a great job on any task!! A good cornernman will pump you up, train you, be with you in tough times, and always tell you how great you are! 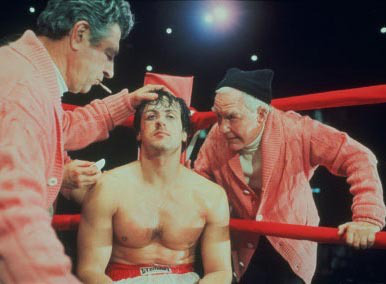 This week find yourself a cornerman, or even better, BE ONE! p.s. How did the story of Wubby and Varsity end? Here’s the email- from Wubby if you are interested..names changed to protect the innocent..
Joel, Below are the 5 calls that I made with a few notes about how they went. I left a few voicemails, but I wanted to talk to 3 so I called a couple extra. XYZZ Homes – Left a voicemail. Had called earlier this week with the same result. Said who I was but didn’t give much information. Just asked them to call me back to discuss some things. I will follow up again next week. ABCD Remodels – Jeff and Gregg are the owners. They were working on one of my neighbors homes for a remodel a few weeks ago so I went and talked with them. They didn’t answer any of my calls until today. Worked out great because they are doing a bathroom remodel right now in West Allis and they asked if I could be out there to measure TODAY! I will be out there this afternoon. They have a lot of customers looking for hardwood or tile and are normally sending people to big box stores. They want to come in to the store in the next few weeks to meet with me. BYK Construction and Remodeling – Spoke to Andrew the owner. Had called before but never gotten through to him. Gave him my 30 second elevator speech and he told me that he is content with his flooring options now (didn’t say who he goes through). Stole a line out of Spuda’s book and told him that’s great that he’s content and his needs are being met, but my goal and our company’s is to go above and beyond having our partners be content. We will go the extra mile to please you and the clients that you work with. My goal Is to make your life easier whether it be saving you time, saving you money, or meeting clients on site or during late hours to accommodate. Andrew made a joke about making his life easier and asked about babysitting his kids. That broke the ice for us and had us laughing. He said that I should call him again in a few weeks and he’ll be done with the project he’s on now and will come in to meet. Handydude Remodeling – Been speaking with the owner Austin for a few weeks. He has said that he wants to come in and meet but hasn’t had the time. I said we just 20 minutes to sit down with you and discuss what we can do to make life easier for you. If we need to come meet you on a jobsite we’d be more than happy to do that. Take a twenty minute lunch break, I’ll bring you lunch and we can chat. He asked me to give him a call in a month or so, right now he just can’t commit to meeting. All in all the calls went well. Landed a measure and a face to face today and will lock down a time for them to come in and meet in the next couple weeks. ← ROCK THE BOAT- BUT DON’T GET SHOOK!